SOMEONE’S PLASTIC-TIE MAY BE ANOTHER’S PERCH . . . . I noticed several weeks ago that the hummingbirds were showing a preference for the vertical feeders over the flat feeders with a perch. With the garden beginning to take shape and plants being moved around I relocated the bird feeders to minimize their interference with the planting scheme. I took the opportunity to retire the flat hummingbird feeders and replace them with two more vertical feeders which bring the total number of hummingbird feeders to six. 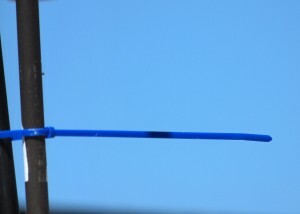 I fashioned a new hummingbird feeder pole by binding two separate poles together using several self-locking plastic-ties. The result was a single stand with four hanging hooks. At the time I didn’t have a tool to cut the plastic-ties flush to the pole which left a 6 inch plastic-tie extension out from the pole. I reminded myself to take care of the cosmetic work later. Several days passed and I kept seeing the plastic-tie extension and kept reminding myself to cut that thing and clean it up. As I was about to do just that, I noticed a hummingbird which had been feeding at one of the feeders flew down to the plastic-tie and promptly took a seat, looking around like he had just been upgraded to first class. “Wow,” I thought, “take a look at that!” The more I watched the plastic-tie I observed a number of hummingbirds taking advantage of the plastic-tie perch. Being a well-trained American with deep roots in, “more is better,” I had an obligation to add more plastic-tie roosts. The plastic-tie in question is blue in color, so of course, I thought it would only be appropriate to add a plastic-tie in the hummingbird’s favorite color – RED! Instead of locating a pair of scissors to trim the blue tie, I located the package of plastic-ties and promptly grabbed a red one and headed for the feeder. The pole presently only has two plastic-tie perches. To date the BLUE tie is preferred over the RED tie by the hummingbirds. This could however be a placement issue rather than a color issue. The blue tie is located below the hanging vertical feeders whereas the red tie is located higher on the pole amongst the hanging feeders. I suspect that the red tie amongst the feeders is not an ideal location since every inch of that area is viable contested air space by the territorial hummingbirds. I speak from experience having been in the middle of such contested air space while refilling the feeders. My head seems to be a favorite gathering point for hummingbird conflicts with hummingbirds setting up on either side of my head while they determine their individual strategies. It has become aware to me that the hummingbirds know who their feeder re-filler is. Now when I refill the feeders the hummingbirds merely work around me on the other feeders, unless of course, some kind of disagreement is occurring at the time. I plan on relocating the red tie to a closer proximity to the blue tie. I promise not to get carried away with, “more is better,” by placing a plastic-tie every three or four inches up and down the pole. The hummingbirds have also been using the oriole feeder on a regular basis. A pair of Hooded Orioles are now making brief daily visits to the feeder. They are very wary but seem to becoming more comfortable with the feeder. I spent several hours last Sunday morning doing a Father’s Day Backyard Bird Count. I had hoped to capture all the seen or heard birds with a photograph as well. In the two hours of counting and photographing I was able to record 25 species photographing 21 (List below). Snowy Egret, Great Egret, Turkey Vulture, Cooper’s Hawk, Red-shouldered Hawk, Red-tailed Hawk, American Kestrel, California Quail, Mourning Dove, Anna’s Hummingbird, Costa’s Hummingbird, Western Scrub Jay, American Crow, Common Raven, California Thrasher, Violet-green Swallow, House Sparrow, American Goldfinch, Lesser Goldfinch, House Finch, California Towhee, Black-headed Grosbeak, Hooded Oriole, Red-winged Blackbird, Brown-headed Cowbird. NOTE: Now, I’m not saying that all the photographs are post card quality, but in just about all the cases the birds can easily be identified. Below are some of the photographs representing the range of quality and representing 12 of the 21 photographed.